This Kiawah Island, S.C. project is located in a maritime forest where the maximum coverage for all non-permeable elements is about 4,600 square feet, and the Architectural Review Board required the retention of significant trees. Have you entered yet? 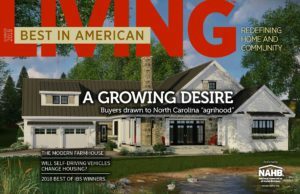 The 2018 Best in American Living™ Awards deadline is Aug. 24! The design strategy was to utilize the Craftsman Style in developing a “Jewel Box” that nestled into the trees and used natural wood siding with metal and cedar or slate roofs. The design takes full advantage of the expansive views and park-like setting.